during possible early stage of development. and based on the consideration of reduction of cost. ity of product, may be recognized closely. product, it may cause a big loss for a purpose of invest- ment. 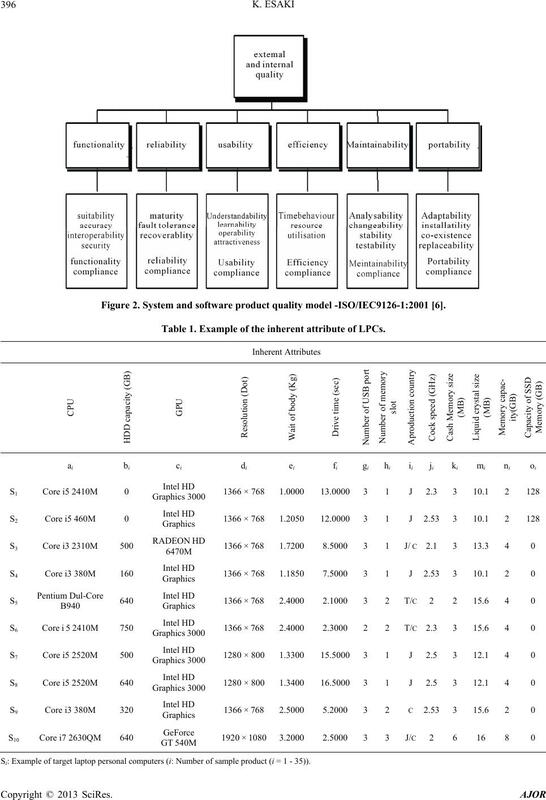 using the ISO/IEC9126-1 quality model. tiveness of the technique to evaluate. the inherent attributes of the product. tation supported by ISO/IEC25000 (SQuaRE) series. 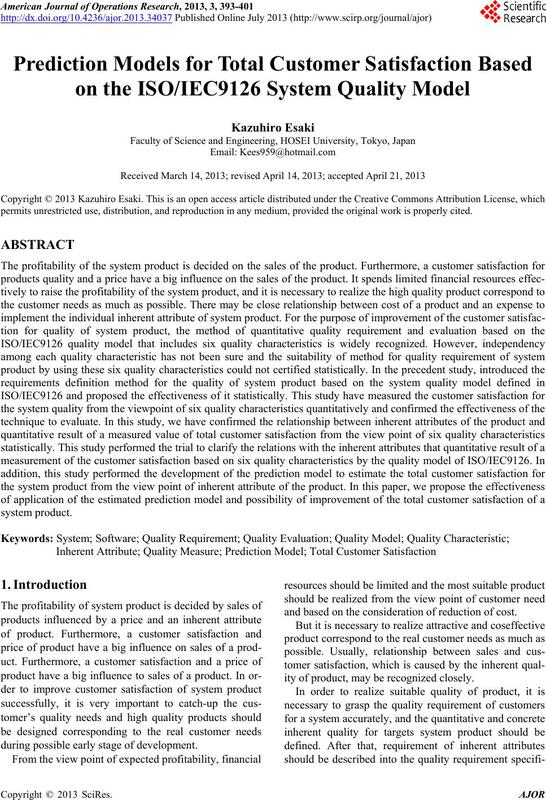 tion for system product quality. inherent attribute that you should realize with a product. 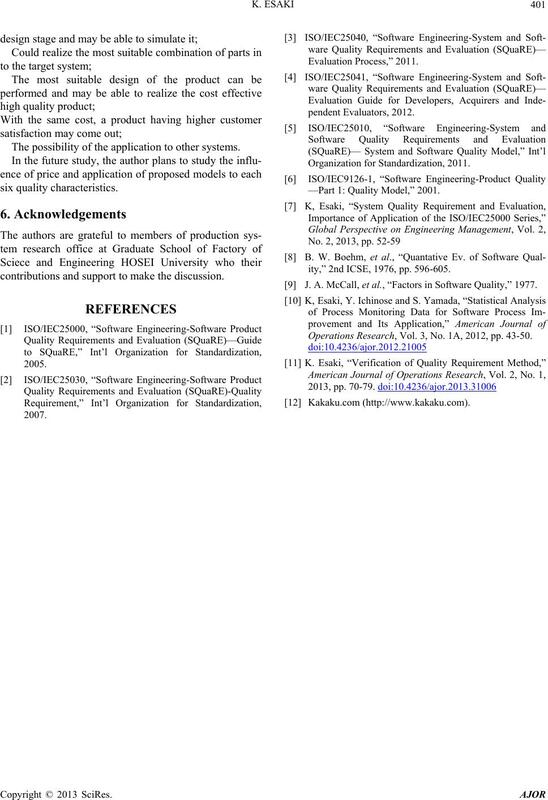 as the criteria of system and software product evaluation. the target system based on the customer needs. ent attributes of the products. this study focus on the ISO/IEC9126-1. vides the ease of use of the system. ment and the usage environment. 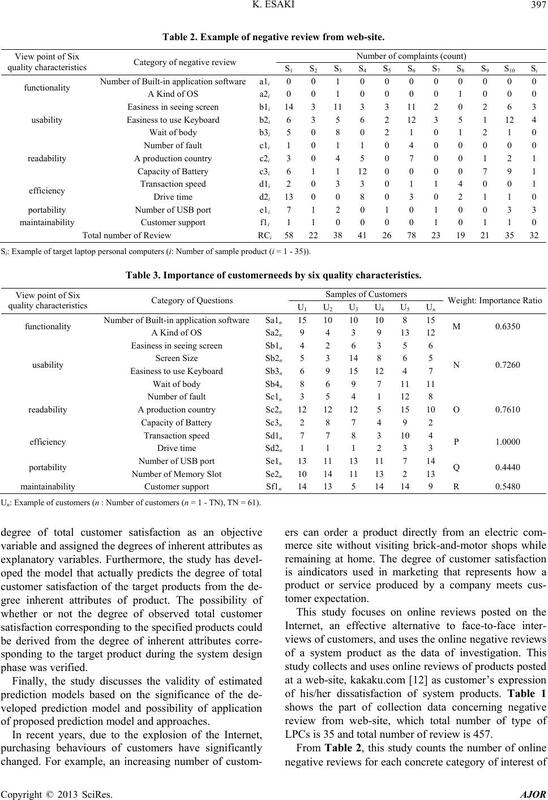 tion for each quality characteristic as shown in Table 3.
acteristics for the each target system. ity characteristics based on the result of precedent study . Figure 2. 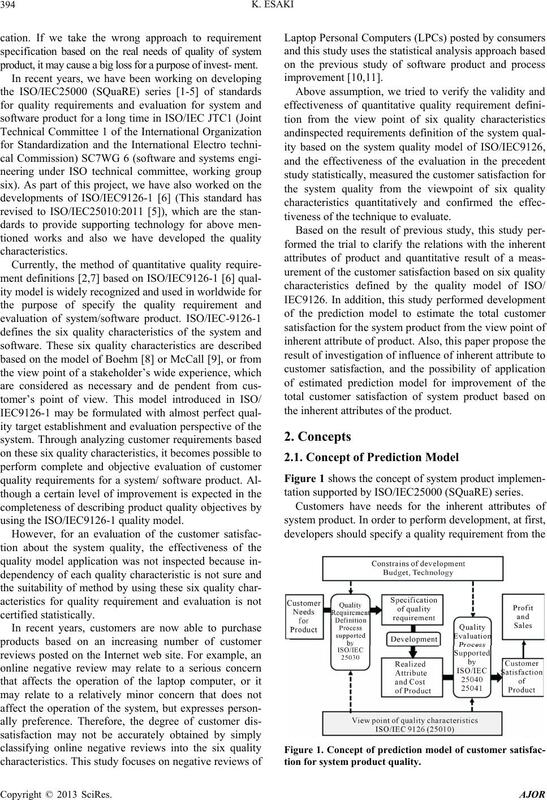 System and software product quality model -ISO/IEC9126-1:2001 . Table 1. Example of the inherent attribute of LPCs. Si: Example of target laptop personal computers (i: Number of sample product (i = 1 - 35)). Table 3. Importance of customerneeds by six quality characteristics. 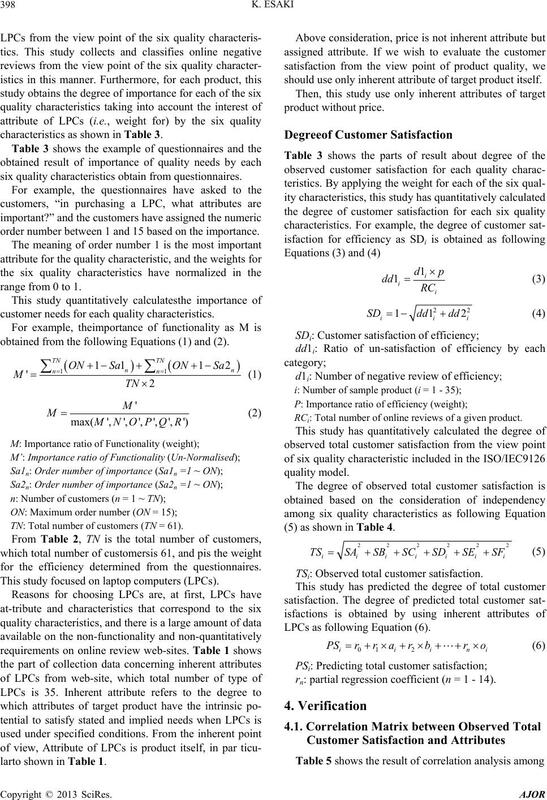 Un: Example of customers (n : Number of customers (n = 1 - TN), TN = 61). 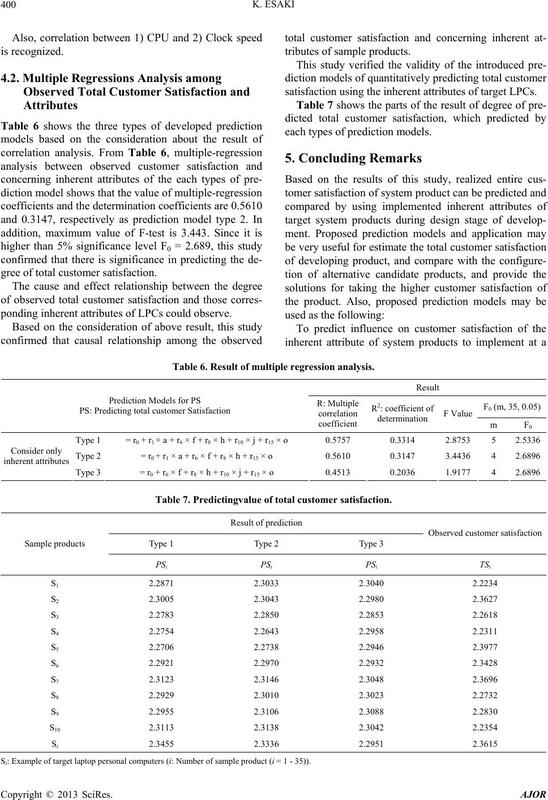 of proposed prediction model and approaches. LPCs is 35 and total number of review is 457.
characteristics as shown in Table 3.
six quality characteristics obtain from questionnaires. order number between 1 and 15 based on the importance. range from 0 to 1.
customer needs for each quality characteristics. obtained from the following Equations (1) and (2). TN: Total number of customers (TN = 61). for the efficiency determined from the questionnaires. This study focused on laptop computers (LPCs). 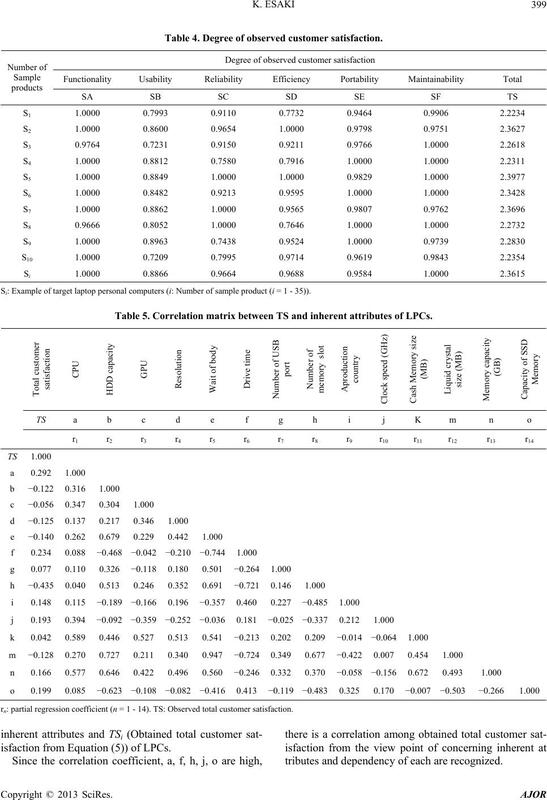 larto shown in Table 1.
should use only inherent attribute of target product itself. RCi: Total number of online reviews of a given product. (5) as shown in Table 4. TSi: Observed total customer satisfaction. LPCs as following Equation (6). rn: partial regression coefficient (n = 1 - 14). rn: partial regression coefficient (n = 1 - 14). TS: Observed total customer satisfaction. isfaction from Equation (5)) of LPCs. tributes and dependency of each are recognized. gree of total customer satisfaction. ponding inherent attributes of LPCs could observe. satisfaction using the inherent attributes of target LPCs. each types of prediction models. Table 7. Predictingvalue of total customer satisfaction. The possibility of the application to other systems. contributions and support to make the discussion. 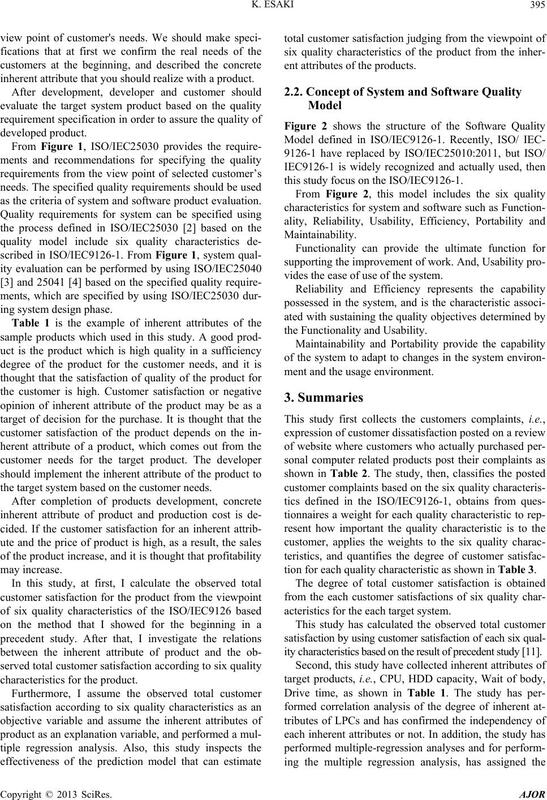 —Part 1: Quality Model,” 2001.
ity,” 2nd ICSE, 1976, pp. 596-605. J. A. McCall, et al., “Factors in Software Quality,” 1977. Operations Research, Vol. 3, No. 1A, 2012, pp. 43-50.